from rainforest: Just a quick update - SCE has now posted a $25 rebate for our product in case you have customers in the greater LA area (but not in LA proper). All the best for the new year. You may have noticed, but we have made some changes to our overview page! 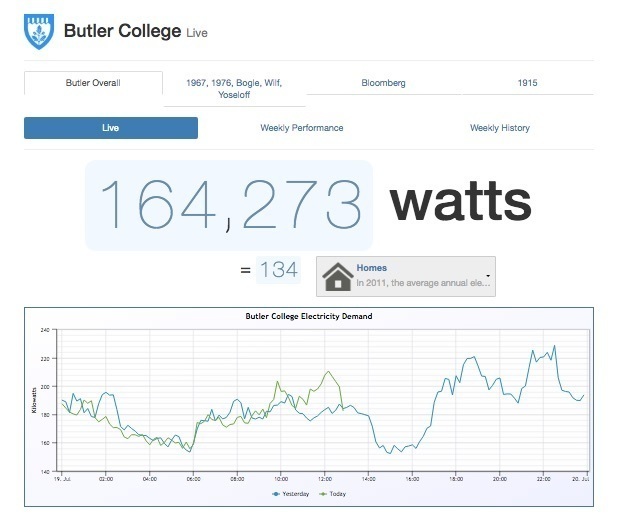 Now, instead of seeing your live history, you can now view your projected energy saving compared to the week before as well as basic information about your house. Be on the look out for more cool features and updates to our site! Solar Array: With 16,500 photovoltaic panels covering 27 acres, Princeton‘s new solar collector field is among the largest single installations at a U.S. college or university.About 80 percent of the system is composed of SunPower T0 Trackers, which use a global positioning system to track the sun each day to maximize energy capture.The project site is located on land adjacent to Princeton‘s main campus between the New Jersey Transit "Dinky" spur line, the Delaware & Raritan Canal, Washington Road (Mercer County Road 572) and Route 1.The project was built on land that holds the “spoils” from dredging Lake Carnegie back in the 1970s, so it would have been quite challenging to farm or locate a building there.At night, the solar array reports negative power, as it draws energy from the grid to maintain its systems. On a night with a full moon, the solar array draws noticeably less power. Gas turbine: Princeton operates a gas turbine engine that produces electricity and heat for steam. Derived from the same engine that propels the F/A-18 Hornet and F117 Nighthawk a.k.a. “stealth fighter” aircraft, the LM-1600 can produce over 15 megawatts of power, enough to power most of the campus.Princeton’s co-generation facility squeezes maximum efficiency out of the engine, by capturing the hot exhaust and using it to pre-heat feed-water before it enters the boilers. Steam Turbines: These steam turbines capture energy that would otherwise be lost in Princeton’s steam distribution network. Essentially small “backpressure” steam turbines driving an electrical generator, these self-contained power systems operate in parallel with pressure reducing valves. After high-pressure steam is used to generate electricity, it is exhausted from the system at a much lower pressure – required for safe use in campus buildings. The two small turbines in the basement of Dillon Gym produce enough electricity to power several dorms. In combination, they can produce a maximum of 540 kilowatts. Chilled Water: Chilled water is used to cool the campus, and can also be used as an energy reserve.Electricity is used at night to chill water. The cold water is stored and then used during the day for air conditioning and research equipment such as lasers, CAT-Scan equipment, electron microscopes and computer facilities. This allows the university to purchase electricity when it is least expensive and avoid using power when it is most expensive and the electric grid is most stressed.A ton of cooling is equivalent to the amount of heat (removal) associated with melting 2000 pounds of ice over a 24 hour period.By centralizing heating and cooling operations in the co-generation plant and creating a “district energy system”, energy life-cycle costs and carbon footprint for Princeton’s campus is greatly reduced. Steam: Steam is generated to deliver heat to campus buildings and for other needs such as sterilizers, cage washers, autoclaves, dining facilities, and domestic hot water.Steam travels via underground pipes to all buildings on campus, and is distributed within buildings at safe pressures.The campus can use up to 200,000 pounds of steam per hour. This is equivalent to about 237 million Btus per hour.By centralizing heating and cooling in the co-generation plant, the life-cycle cost and carbon footprint of campus energy are greatly reduced. Steam Pressure: Steam is generated to deliver heat to campus buildings and for other needs such as sterilizers, cage washers, autoclaves, dining facilities, and domestic hot water.Steam travels via underground pipes to all buildings on campus, and is distributed within buildings at safe pressures.The campus can use up to 200,000 pounds of steam per hour. This is equivalent to about 237 million Btus per hour. 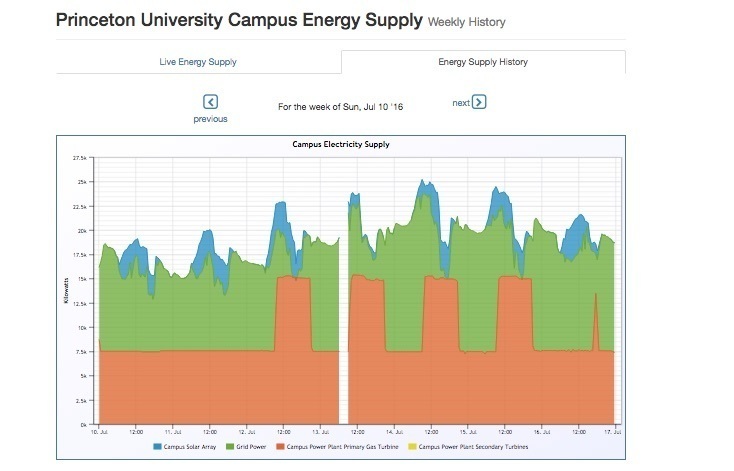 By centralizing heating and cooling in the co-generation plant, the life-cycle cost and carbon footprint of campus energy are greatly reduced. Purchased Natural Gas: Natural gas is burned in the gas turbine and boilers to produce steam and electricity.A dekatherm is equivalent to 1000 cubic feet of natural gas (think of a cube, 10 feet on a side).Depending on the real-time price of electricity, it’s often more efficient for the university to buy natural gas and generate heat and power than to purchase electricity. 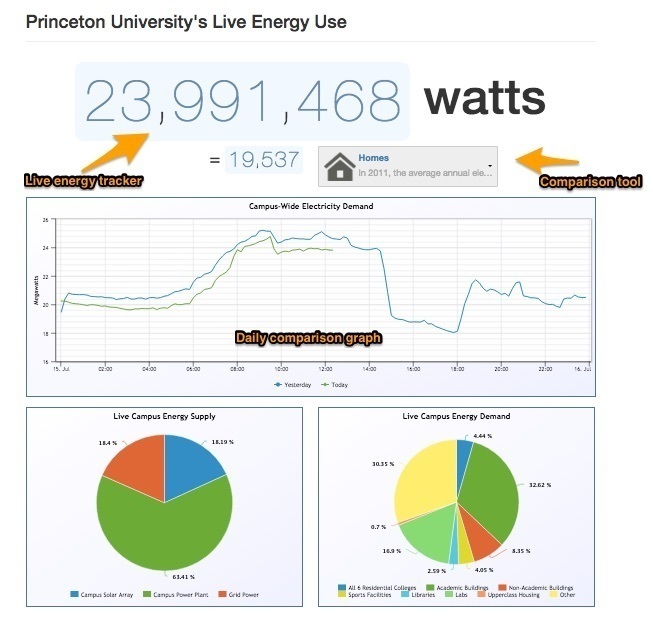 Purchased Grid Power: Princeton is connected to the PSEG electrical grid. 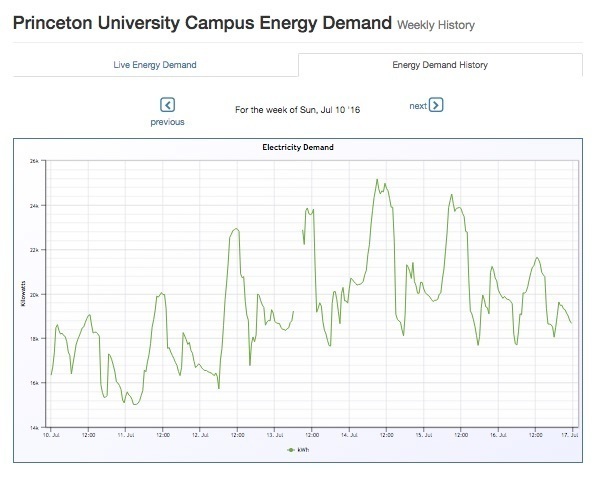 At peak demand, Princeton uses as much as 27 megawatts of power.Because Princeton is such a large customer, it buys electricity at real-time prices that change every five minutes. The energy price generally correlates with how much power is being used by the whole Pennsylvania-New Jersey-Maryland grid. Based on the predicted market price, Princeton Energy Plant operators decide whether to generate electricity or purchase from the grid. 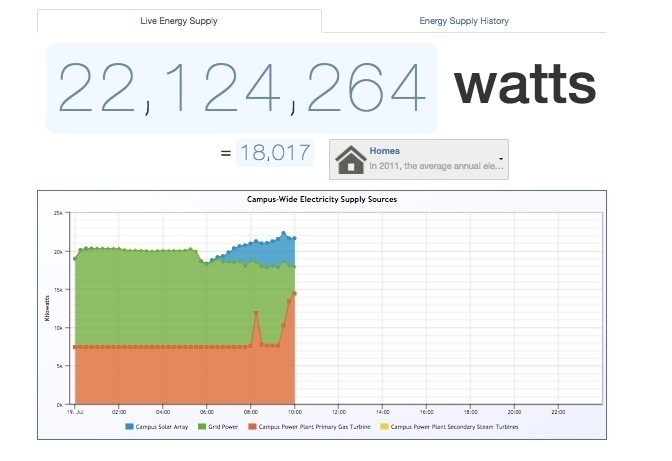 Just like the other overview pages, you can view both live history and a weekly overview of energy demand. The six residential colleges are listed in rank order by their projected energy use for this week. The week starts and ends on Sunday at 00:00:00 ET (Midnight on Saturday). The "baseline" is the average of the most recent two completed weeks. 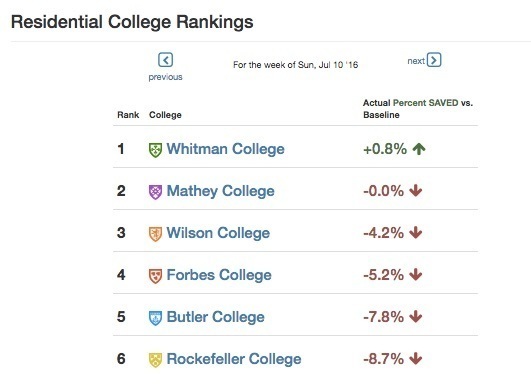 So if a college is "+3.5%" they are projected to use 3.5% less energy than they did on average over the previous two weeks. The projection is based on data collected today. You can click on each college and view data specific for each. 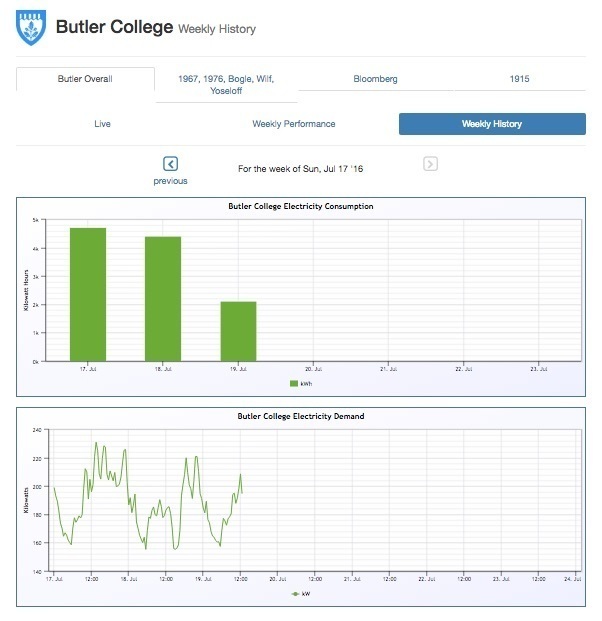 On the overview page ,you can view the overview of all of Butler College as well as the individual building. 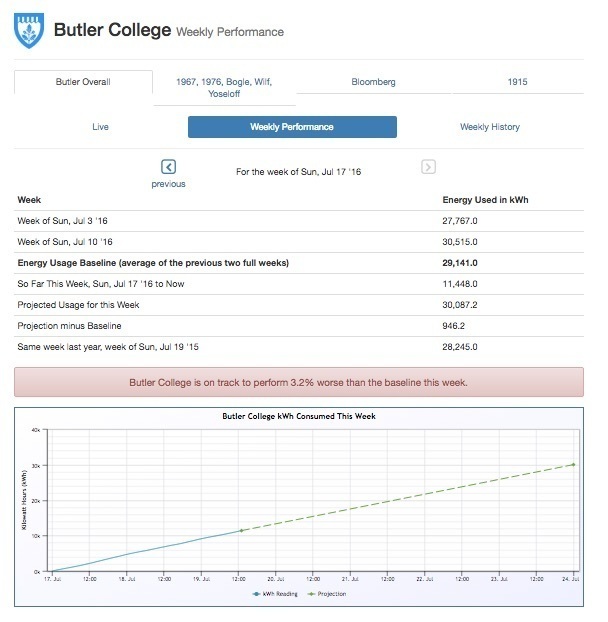 There is the live feature and graph as well as the weekly history view. 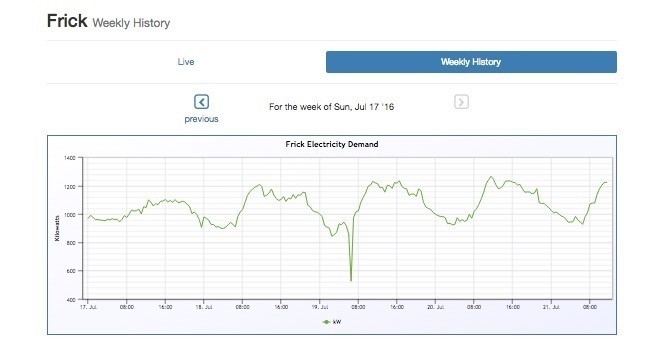 On this page, you can view the details of the energy use as well as projections of energy use for the week ahead. You can view this data as an overview of the whole college as well as the individual buildings. For each building, you can view both live and weekly history. We have some very exciting news. As many of you have requested, we finally have Time of Use pricing as an option on our site! 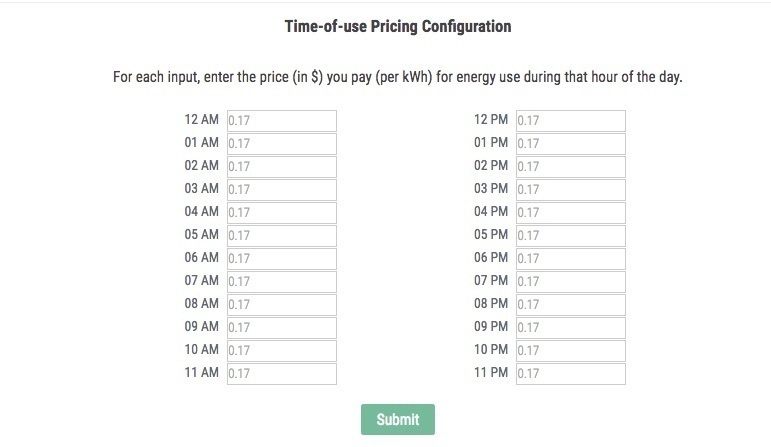 Time of use pricing is a system of energy pricing that encourages users to use energy at off-peak times by charging different prices depending on the time of day. This not only lets users save money on their energy bill but also reduces the strain on the grid. If you too have a feature request, please contact us at info@wattvision.com! We are happy to welcome a new wave of users from Bluedot. We are here to help make your transition as smooth as possible, so if you are having trouble switching over to wattvision, please do not hesitate to reach out and contact us. We look forward to providing you with amazing energy tracking service to help facilitate your energy saving goals! A tip to switching over to wattvision: A few of our users have had some trouble adding their rainforest eagle, but we found if you refresh the GUI on your rainforest Eagle, and then add it to Wattvision, you should be good to go! Everywhere we look, we are bombarded with demands from the media to do certain things: save the earth, recycle, go green,live sustainably. All of these virtues sound like good things but do we ever stop and think what they really mean? Why is living a sustainable life important? What does it even mean to live sustainably? Today we are going to break down why sustainability is one of the most important things in 2016 and the easy changes you can make to live a more sustainable life. We live in a world where everything has to be plugged in. This leads to a high demand for electricity and unfortunately, most of the electricity comes from fossil fuels. There has been progress to moving to more renewable resources like nuclear, solar, hydro and wind, but until all energy can be produced this way, it is important to be as energy efficient as possible. The use of fossil fuels can be argued to be one of the most detrimental and widespread factors of pollution, so as a result, the easiest way to reduce pollution would be to change the way we use energy. There are many little changes you can make to live a more sustainable life, like riding your bike or only buying locally sourced food, but one of the best ways is be more conscious of the energy that you are using. This is where Wattvision can help. We provide you will all the tools you need to monitor your energy usage in your home and in your businesses which then allows you to make informed decisions. 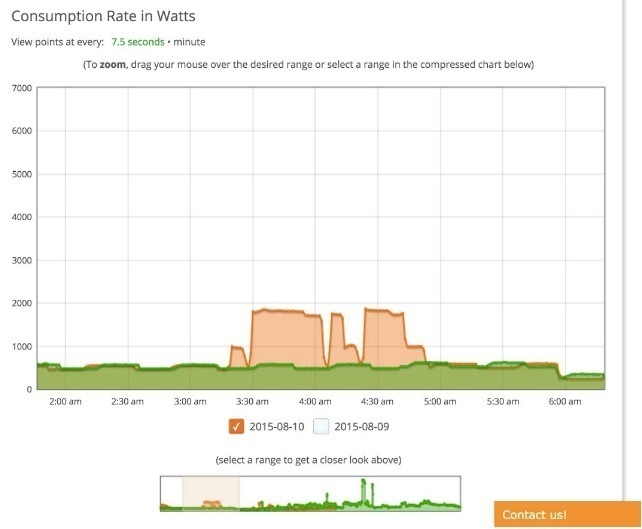 We also have features that allow you to optimize your solar panel production and we are currently adding more. Wattvision is here to help support your sustainability needs through an innovative and easy to use platform. Be on the lookout for more features that will help make sustainability an easy part of your everyday life. Attention Wattvisionaries! 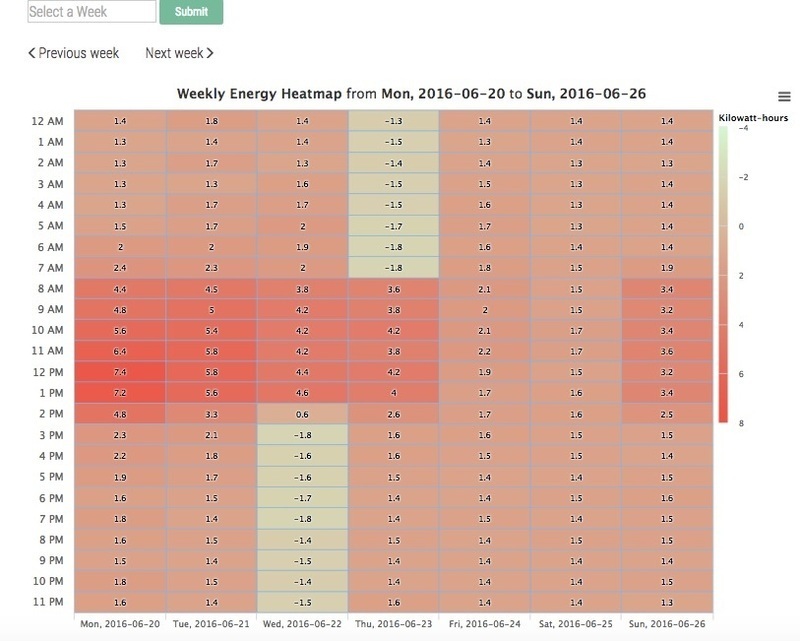 We are introducing a new feature to our site called Weekly Energy Heat Map. This tool allows you to select a week an of data and view your energy in a chromatic way. 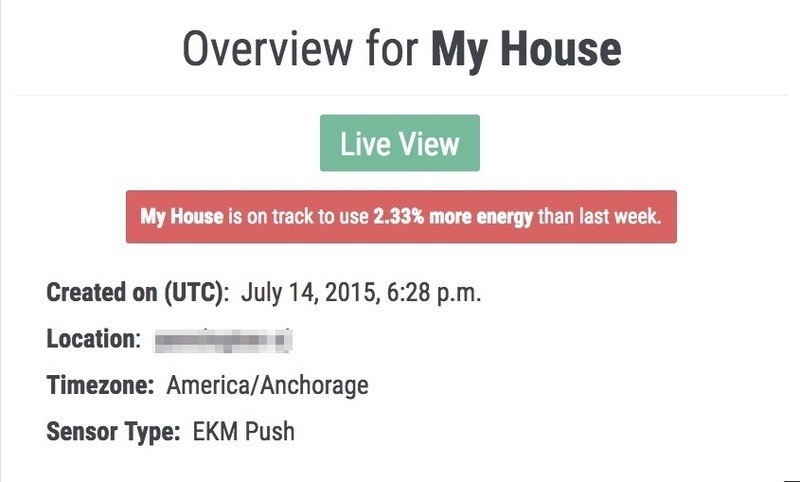 When you log in to your account, you can select weekly view and easy see when you were the most and least efficient in your energy use. 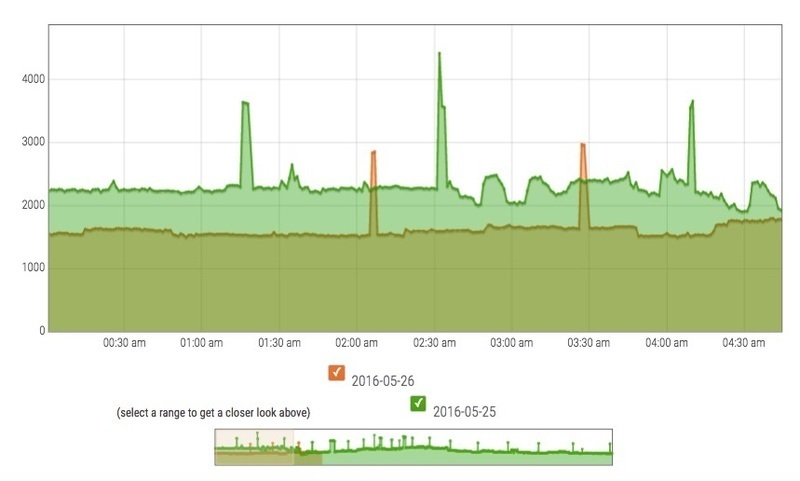 We know that sometimes it's hard to understand all your energy use data or maybe you don't have time to check our usage every day so we are providing you with an easy and visual tool that quickly lets you understand when you are using your most energy on a larger scale. Our goal is to make energy sustainability second nature for all of our users, and through this feature and some new ones we are working on, hopefully, we can come closer to achieving that goal. Make sure you log on and check out your Heat Map. This feature was requested by one of our users, if you have a feature request please reach out and contact us at info@wattvision.com and we will work on adding it to our site! 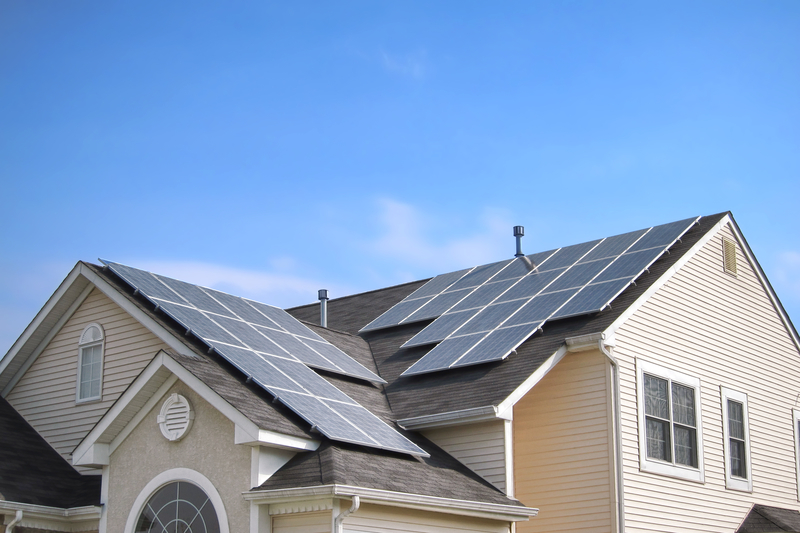 It is an accepted fact that one of the best ways to be more energy efficient is to install solar panels on your house. This idea appeals to both hyper environmentally conscious people as well as average families who are trying to save money every month. They are generally assumed as a good investment because they should pay for themselves in the matter of months and help save the environment . This brings up the question: are solar panels too good to be true? There are many options available when you are looking into getting solar panels. You can buy them or lease them with different plans that allow you to only pay for the energy you use or zero down at signing. There are options for every financial need. Also a lot of states provide tax rebates, lowering the cost of solar energy even more. In some areas, they allow you to sell the energy that you use back to the grid, so you can make money off your solar panels. Since solar energy is a renewable resource, it reduces the need for the production of energy from fossil fuels. The energy that you will be producing will be made with out adding any additional carbon to the air, therefore reducing your carbon footprint. As society, focusing on reducing carbon production is essential to maintain clean air and water and a healthy climate. By helping in easiest and efficient way to cut pollutants , you are helping preserve the environment. Because solar is produced on the roof of your home rather than in a large power plant, the energy is more secure. If a large power plant is knocked out by a natural disaster or an attack on the grid, the more solar cells on residential homes, the more resilient the grid is to power outages. Rather than depending on the government to provide energy for you, you are in control of your own energy production. This means you don't have to worry about energy shortages or costs for years to come. This seems to be the biggest, possibly the only negative to having solar panels. Solar panels are installed on your roof, so to perform roof repairs, you would have to pay the solar companies to remove and then reinstall the solar panels. Also, if you are leasing or have a loan on your solar panels and you move, either the new owners of the home have to take on the lease /loan payments themselves, or you have to pay fees to end your contract early and have the panels removed. This isn't such a major issue because solar panels add enough value to your home to cover these costs in most cases. As you can see, there are many positive aspects to solar energy. 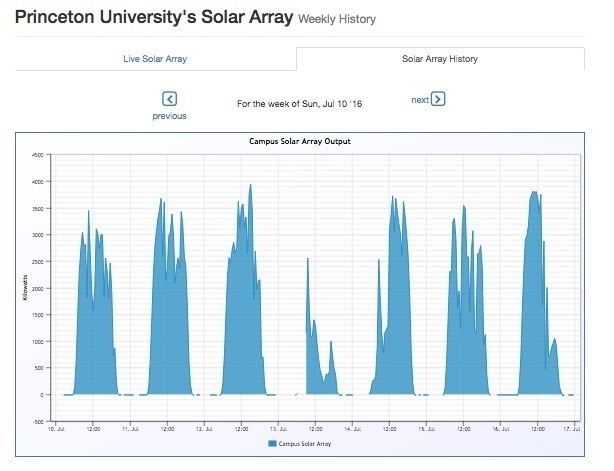 We can't decided whether or not solar panels are right for you, but what we can do is provide the tools necessary to monitor your solar production and energy use. 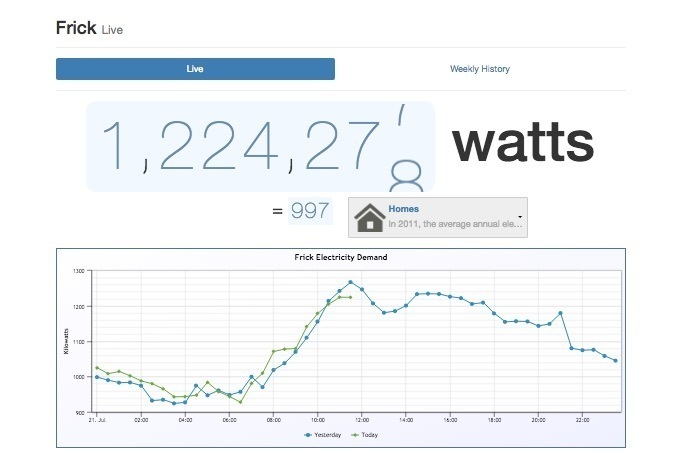 Through partnerships with PVoutput and Rainforest eagle, it is easy to track how much energy you are producing every minute using Wattvision.com . Check it out for your self! 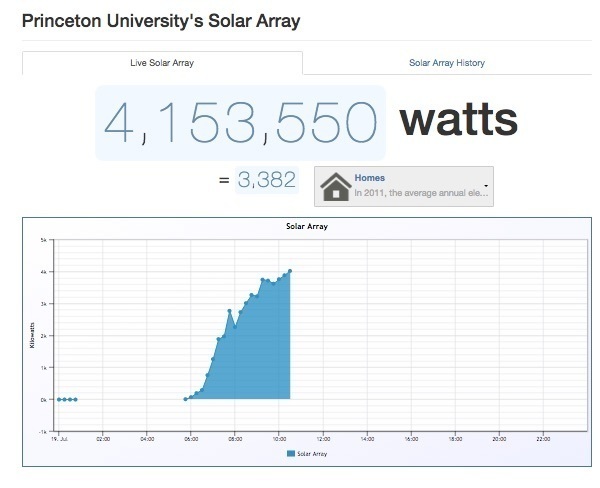 Arguably the most useful features on the Wattvision site are the various graphs, specifically the daily history graphs. Thanks to the suggestion of one of our loyal users, we have updated these graphs. Before, when you selected the range of data you wanted to view, you could zoom in on it but the graphs did not rescale. Now, you can zoom in on any area of the graph, and the both axes rescale to size of the selected data. This makes it easier for users to view their data in a more detailed way. If you have any features you would like to see updated, email sara@wattvision.com and we will do the best to implement it! We are committed to making it as easy as possible for users to access all the tools they need to save energy. Be on the lookout for more features and improvements coming soon!